The Pikes Peak Justice and Peace Commission initially grew out of the U.S. Catholic Bishops’ “Call to Action” endeavor prompted by the Second Vatican Council. The Council had raised an awareness that commitment to social justice is not an option for Catholics; it is a requirement of our faith. In an attempt to publicize this concept the Catholic Archdiocese of Denver wanted to facilitate the formation of Justice and Peace Committees in Colorado Springs and other cities within its geographical jurisdiction. A Dominican priest, Rev Jerry Stookey was the Archdiocesan coordinator of this effort and he enlisted the help of Sister Dominique Pisciotta, a Franciscan Sister out of Rochester MN, who was ministering in Colorado Springs at the time, to organize a “Call to Action” symposium in the Springs. In October of 1976, a three day “Call to Action” event was held at St. Mary’s High School which motivated people to get involved in social justice issues. One of the many ideas to be born from it was the conception of the Pikes Peak Justice and Peace Commission. Three people are considered to be founders of PPJPC: Sister Dominique Pisciotta, Mary Ann Fiske and her husband Chuck Hosking. It was in the summer of 1976 that organizer Mary Ann Fiske and her husband Chuck Hosking had moved from St. Louis to Colorado Springs. In St. Louis they had been involved in a political effort to remove sales tax from food and medicine because it was so hard on the poor. They had no sooner gotten settled in the Springs when they realized that the same campaign was being waged here. It was on the picket lines at the downtown grocery store that Dominique met Mary Ann and Chuck, and so it began! The anti-tax activists lost in the November election but some really fine, justice-seeking folks found one another that autumn. By February 1977 a small group of members adopted the following goals: 1) To act as a consciousness-raising group on issues of social justice; 2) To promote educational opportunities concerning these social issues; and 3) To organize, support and lead meaningful action programs relating to social issues. Members looked at the needs of the local community and formed three initial Task Forces: Battered Wives Task Force; a Church-Military Relations Task Force; and the Utilities Task Force. “But those early years were difficult” said Sister Dominique. “There were times when we didn’t have enough people to have meetings or a newsletter, so just a few of us kept things going.” It soon became evident to Fr Stookey and to Sister Dominique Pisciotta that, given the population of Colorado Springs, an ecumenical peace and justice group made a lot more sense than a Catholic diocesan group. Even so, the Catholic Church continued to help support the PPJPC until Michael Sheridan became Bishop of the Colorado Springs Diocese in 2004. In November 1978, PPJPC was officially incorporated in the state of Colorado. That year a Food Task Force was formed and urged citizens to join the INFACT’s boycott of Nestle products because of the company’s promotion of infant formula in poor countries. Infant deaths had doubled where mothers were convinced to switch from breast feeding to bottle feeding in Asia, Africa, and Latin America. Mary Ann trained speakers to take the INFACT slide show to schools, churches and lodges. Mary Ann remarked that “in every crowd there was at least one radical who was eager to find like-minded folks. The Fiske/Hosking home became the office of the new PPJPC and their mimeograph machine cranked out the Commission’s first quarterly newsletter. In June 1979, twenty-nine local clergy, including Bishop Richard Hanifen, signed an anti-death penalty petition circulated by PPJPC which was forwarded to Colorado Governor Richard Lamm and members of the Colorado Senate. Another 1979 project was to prepare a directory of farmers in El Paso, Fremont and Pueblo counties who would sell directly to the public from their farms—the beginning of Community-Supported Agriculture! By the end of 1979 the Commission had lost direct sponsorship of the Archdiocese of Denver which meant that PPJPC would not be considered a Catholic organization. 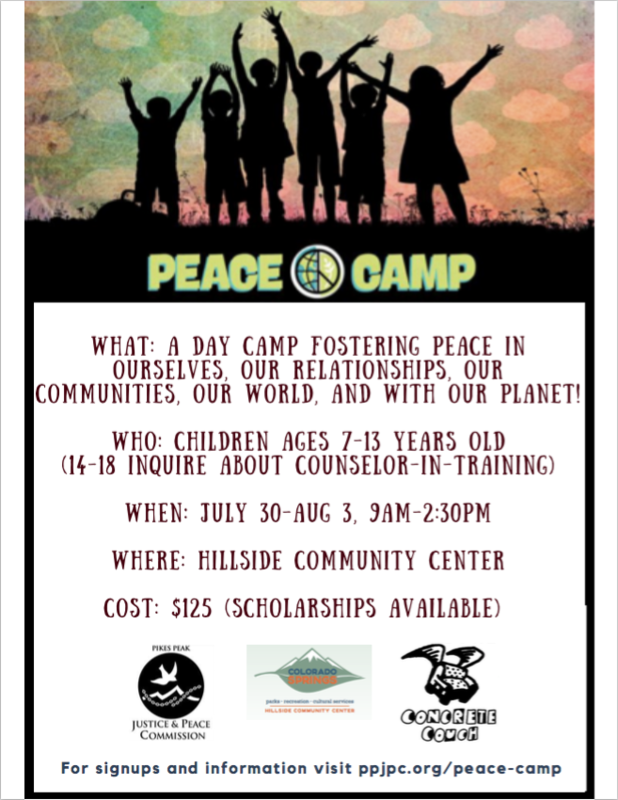 SIGN UP for Peace Camp!